Japanese flowering dogwood bears white, star-shaped blooms which appear later in spring than the flowers on other dogwoods. Fall foliage is purplish-red. The red berries of Cornus kousa trees persist into winter. 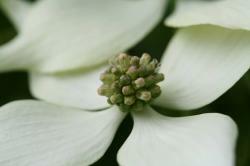 Kousa dogwood grows to an average height and spread of fifteen to thirty feet. Young trees have a vase-shaped form, but in older trees growth shows more horizontal spread and the form becomes rounded. This tree grows at a slow to moderate rate, average ten feet in fifteen years. Kousa dogwoods are more resistant than flowering dogwood to dogwood anthracnose and powdery mildew. They are also more resistant to borers than flowering dogwood. 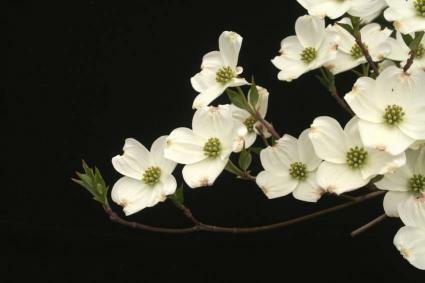 Japanese flowering dogwood does not tolerate drought, so irrigate deeply during dry weather. It can grow in full sun to light shade. Ideal soil is moist but well-drained, fertile, and slightly acidic. Kousa dogwood is hardy in zones 5 - 8. 'Snowboy' - white flowers, green-gray leaves edged in white. Color best in shade.